Congested gutters can cause not only improper drainage but damage to your house. 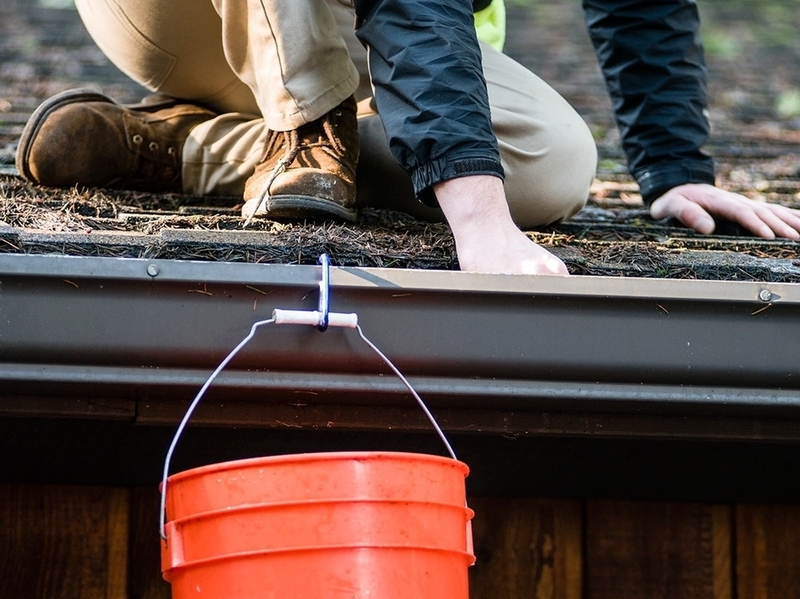 Professional gutter cleaning ensures unobstructed flow in gutters and downspouts. We remove debris by hand then flush with water in order to achieve proper drainage and cleanliness. Pine needles, leafs, moss and more tend to stick and stay on roofs. These materials can make your home unsightly; or worse, cause damage to it. Avoid both by getting a comprehensive roof cleaning through Top to Bottom Services. We blow, brush or spray debris from your roof for a pristine result without any risk of damage. If a mossy roof is your problem then our moss removal is your answer. We apply a moss killing treatment and return once it has taken effect to gently remove the debris. Afterword, another treatment is done to ensure no regrowth will occur. Nothing enhances the aesthetic pleasure of a living space more than luminous sunshine through crystal clear windows. Our window washing service will leave your windows radiant and streak free. Get your sills and screens cleaned for an immaculate result. Has your driveway, siding, walks or walls accumulated debris and dirt? Pressure washing is the best solution when the surfaces around your home look less than exquisite. Our pressure washing service removes the dirt and grime that makes your outdoor space an eyesore in a safe and efficient manner. We have the tools and experience to keep these spaces neat and tidy without fear of damage or mess. A dryer vent that is full of lint is not only a fire hazard, it also causes a reduction in the efficiency of your dryer. With our dryer vent cleaning, the technician will remove all of the lint and debris from your dryer vent, give your lint trap a detail cleaning and do a full inspection of your dryer vent to ensure everything is working properly.